This fall, several months after revealing a new 150th anniversary logo, The Cooper Union launched the first phase of a long-awaited new web site. 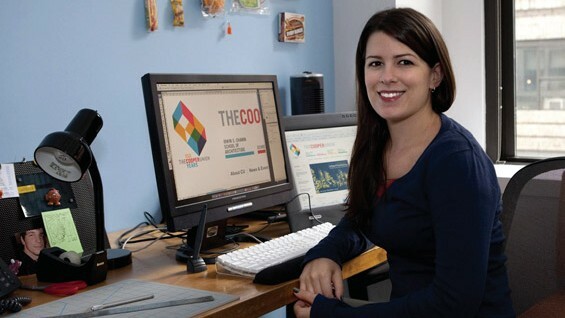 As a Cooper alum, I was honored when the college approached me to lead the redesign. To support this endeavor, I brought on two talented partners, the first specializing in systems architecture and programming and the second in page template builds. 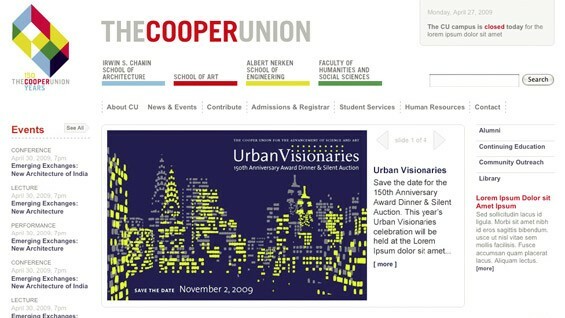 Originally built in the late ’90s, the existing Cooper Union web site had not evolved dramatically. Updates and news posting required manual page builds and labor-intensive coding. Unavoidably, the site took on an outdated look and inevitable inconsistencies. As an art director and information architect, I was excited to help reduce administrative workload and, more importantly, facilitate the timely posting of news, events and other important information. Even in our first phase, the new site allows multiple users from within the institution to submit and edit content simultaneously, with varying publishing privileges. These college-wide contributions will ultimately help the web site reach its full potential later next year, when we roll out phase two and include redesigned sections for the four academic divisions: art, architecture, engineering and humanities. For phase one, these sections of the site will remain as-is within the new site’s redesigned framework. I have worked professionally with The Cooper Union in the past, but this new web site is by far my largest project with the college. It has been fantastic to work with the administration and the Center for Design and Typography. My design team and I enthusiastically await the next stage in the project and the subsequent feedback!